NASA astronaut Tracy Caldwell Dyson plays with mini soccer balls in the weightless environment of the International Space Station. She and her crewmates plan to cheer on the games at the 2010 World Cup international soccer tournament. World Cup soccer mania has launched off planet Earth andreached astronauts living on the International Space Station. The three spaceflyers currently on the orbiting lab willjoin millions of soccerfans on Earth cheering on the teams competing in the 2010 FIFA World Cuptournament, set to begin Friday in Johannesburg, South Africa. "We get together every evening for dinner and sitaround the TV," said American astronaut Tracy Caldwell Dyson of NASA, onthe typical routine at the station. "I bet you there will be some cheeringaround the table as we get World Cup soccer sent up to us." Caldwell Dyson lives on the space station with two Russiancosmonauts, including commander Alexander Skvortsov ? who lists soccer as oneof his main interests in life in his biography. And the station crew plans totake advantage of their specialviewpoint on the games. "We can see the great country that the sport's beingcelebrated and played in," Caldwell Dyson said. "I think that there'sa few that would like to be able to see the games in person up here." 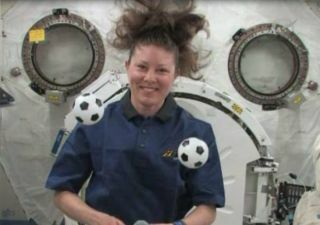 Caldwell Dyson played with some miniature soccer balls inher weightless environment, head-butting one on a NASA video. Yet shemaintained that her crewmates were the real soccer experts. "I'm not much of asoccer player," she said. "We do have a captain of the soccerteam in Star City, Russia on board with us." Caldwell Dyson, Skvortsov and fellow Expedition24 crewmate Mikhail Kornienko are in the middle of a six-month mission onthe space station. They are awaiting the arrival of three more stationresidents next week, with the Russian Soyuz TMA-19 spacecraft set to launch onTuesday at 5:35 p.m. EDT (2135 GMT) from Baikonur Cosmodrome in Kazakhstan. Thespaceship will deliver NASA astronauts Doug Wheelock and Shannon Walker, and Russiancosmonaut Fyodor Yurchikhin, who are each planning to begin a long-term stay. Yurchikhin is a veteran cosmonaut who did not always want tofly in space. In fact, as a child he once thought his future could lead him tothe World Cup one day. "I wanted to be goalkeeper in soccer," Yurchikhinsaid in a NASA interview. But the position of cosmonaut, he added, has alsobeen a longtime dream. Yurchikhin, Wheelock and Walker plan to dock at the orbitinglab on Thursday.